Something’s alarming right enough… but I think it’s actually my linguistics sense. Now, as both a linguist and native speaker of American English, I find this command troubling. Not because I have a problem with civic-minded individuals alerting the power company to potentially dangerous problems, but because it’s ambiguous. I’ve written about ambiguity in language before, but it’s something that I revisit often and it’s a complex enough subject that you can easily spend an entire lifetime studying it, let alone more than one blog post. Let’s examine why this sign is ambiguous a little more closely. Yeah, that’s right, “alarming” is one of the few words that the OED only has one definition for. Let’s put that aside for the moment, though, and assume that there’s a linguistically-creative sign maker working for Seattle City Light who has coined a neologism based on parallels with words like “understanding” or “revolving”. The real crux of the matter is that the command is not a sentence, and has just too many gaps where the reader has to fill in information. If [the alarm is] alarming (in the sense of performing the action which alarms traditionally do, such as whooping and revolving) [then] call. If [you are] alarming [other people, then] call. 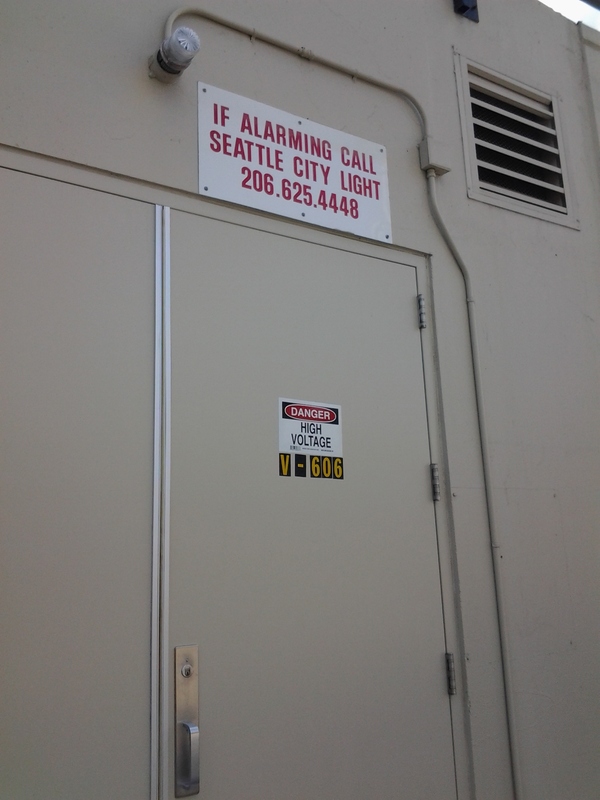 If [the alarm is] alarming [you, regardless of whether or not it’s currently flashing or making noise then] call. Now, English syntax is a pretty resilient beast and can put up with a certain amount of words left out. The fancy linguistics term for this is “ellipsis“, just like the punctuation mark. (This one: …) Words have to be left out of of certain places in certain ways, though. Like you don’t have to say “you” every time you tell someone to do something. “Don’t sit there!” is perfectly acceptable as a sentence, and if someone told you that you’d have no problem figuring out that they were telling you not to sit on their cat. Like everything else in language, though, there are rules and by breaking them you run the risk of failing to communicate what you’re trying to… just like this sign.